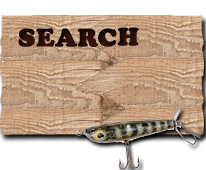 Welcome Vacation Property Owners, Fishing Guides, Charter Captains, Marina Operators, Boat & Tackle Retailers! Why list my property on the internet? More and more people are using the internet to search for information. Out-of-town tourists, fishermen, nature lovers, family vacation planners and more, they all use it to find accommodations to plan their next holiday! If you're not on the internet, you're losing potential clients! List your site with us, and get on the world wide web! I have a website, why should I list on yours? Over the years, we have submitted our site to countless search engines, banner exchanges, directories and promotional websites. 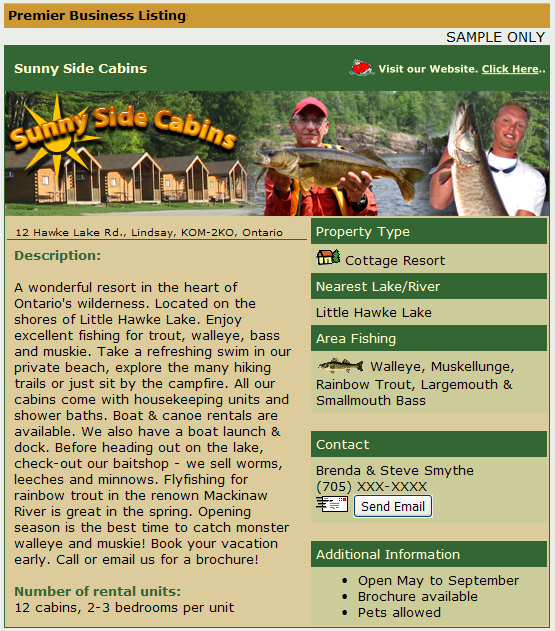 Our traffic is impressive, we get inquires everyday about accommodations on our featured lakes and rivers. In short, we have done all the marketing for you! Join today & let us give you the exposure you need. No! A bronze listing on our site is absolutely FREE! We also offer silver and gold listings at very reasonable prices. Our top level business listing is our Gold Listing account. Nearby Attraction Information, rates & more! One of our most successful packages is our Silver Listing account. Everything in the our Gold Listing, except your ad will appear below any Gold Listings in the specified category. This is our FREE Business Listing account. Simply submit your listing using our online form and we'll add your Business information to our directory. If you would like your website added to your listing, for a one time fee of $4.95 we'll add your website link.